Welcome Mankato High School Class of 1973! This website was created to keep Mankato High School class of 1973 members informed and in touch. We also have a private Facebook page. https://www.facebook.com/groups/Mankato73/ and request to join. This site is for the Mankato Minnesota High Class of '73 graduates only. To start click on the Missing Classmates or Classmate Profiles links and create a login. Fill in your profile information. You are all considered "Missing" until you create a login. If you have any questions click on the Contact Us link. 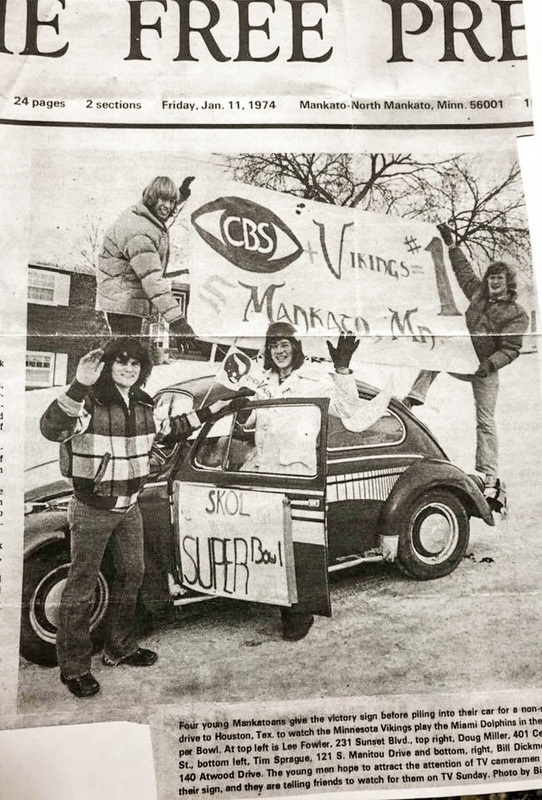 Tim Sprague asked me to share this photo from the Mankato Free Press front page, Friday, January 11, 1974. It is fitting because this Sunday is Super Bowl Sunday. In hindsight, the VW Bug looks might tiny to haul classmates from Mankato to North Mankato, let alone all the way to Houston and back. But still. SKOL! John Kind recently made the Mankato Free Press front page as one of four members of the quartet Quadraphonic. A few of our classmates have asked for a video of the quartet singing at a recent Twins Game. John sings Tenor 2.